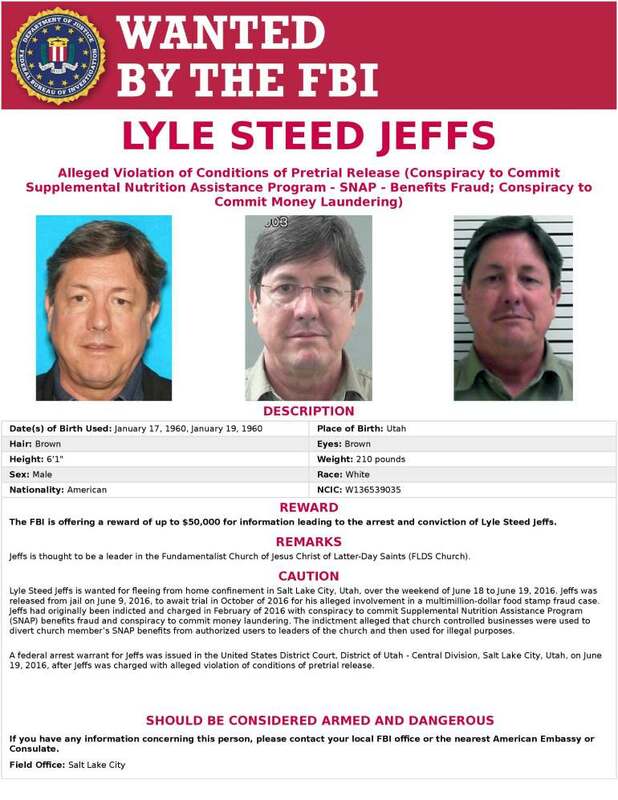 ST. GEORGE — Federal authorities are offering a $50,000 reward to the person or persons who provide information leading to the arrest and conviction of polygamous sect leader Lyle Steed Jeffs, whom authorities said they believe is hiding in Utah. “We believe that Lyle Jeffs may still be in the United States and, indeed, in Utah, so public awareness is key,” FBI Special Agent in Charge Eric Barnhart said at a press conference held Monday to discuss the reward, as well as new information in the fugitive search for Lyle Jeffs. Lyle Jeffs was released from jail on June 9 and ordered to home confinement while awaiting trial on accusations he helped orchestrate a multimillion-dollar food stamp fraud scheme within the Fundamentalist Church of Jesus Christ of Latter Day Saints. FBI investigations revealed that after absconding, Lyle Jeffs spent time in the Short Creek area in July, Barnhart said Monday. The twin cities of Hildale, Utah, and Colorado City, Arizona – collectively known as Short Creek – straddle the Utah-Arizona border and are home base to thousands of FLDS members who consider Warren Jeffs to be the church’s prophet and mouthpiece of God on Earth. Federal authorities said they have indications that during Lyle Jeffs’ time on the lam in Short Creek, he was in communication with his brother, Warren Jeffs, who is serving a sentence of life plus 20 years in a Texas prison since his 2011 conviction on crimes related to marrying and sexually abusing underage girls he considered brides. Barnhart said Monday that the FBI believes Lyle Jeffs received directions from Warren Jeffs that Lyle Jeffs did not follow to the imprisoned prophet’s satisfaction due, in part, to Lyle Jeffs’ concerns of being arrested by law enforcement. Despite his potential falling out with Warren Jeffs, FBI officials said they still believe Lyle Jeffs has supporters who are willing to hide him and keep him from being arrested. Barnhart said the FBI has been receiving a steady flow of tips about Lyle Jeffs since he absconded, and that it is vetting all of them. Anyone with information on Lyle Jeffs’ whereabouts is asked to call the FBI Salt Lake City Field Office at 801-579­-1400 or a local FBI office. I hope I find him. I could really use that money. Come out, come out, wherever you are, Lyle! I laughed when I saw this…the FLDS grifters are going to be rattled with a $50K carrot dangling there. It’s a brilliant move by the FBI who fully understand this band of yahoos, and it should loosen a few tongues…stay tuned, film at 11:00. Their food stamp fraud dwarfs the 50 Grand. Why take a chance of ruining it?